Brian May’s sonic signature not only comes from his home built “Red Special” guitar, but also from a treble-booster pummeling banks of AC30s. He never turns the treble booster off, accessing a wide range of tones simply by manipulating his volume knobs and pickup settings. From his guitar, to the treble booster, to the amps, his entire rig is essentially a singular musical instrument. One that inspires the sort of playing May is known for. We designed the Galileo with this playing approach in mind, that with it you can roll your guitar volume back for jangly AC30 cleans, and crank it up for searing leads and aggressive yet focused rhythm tones. There is something very special about a treble-booster hitting a Vox AC30. The midrange gets super throaty with an amazing harmonic swirl. Back the guitar volume down and that iconic Vox jangle gets magnified – it can sound angry and aggressive, yet chimey and beautiful at the same time. It’s a complex harmonically laden tone that is very compelling to play. Even though the Vox AC30 is mere 30 watts, to crank one up inorder to achieve the tones that May achieved, it is VERY loud. Too much volume for most playing situations. Enter the Galileo! The Galileo is a custom-tuned Rangemaster booster combined with the pre-amp section of a Vox AC30 delivering the distinctive throaty mid-range and jangly crunch of Brian May. 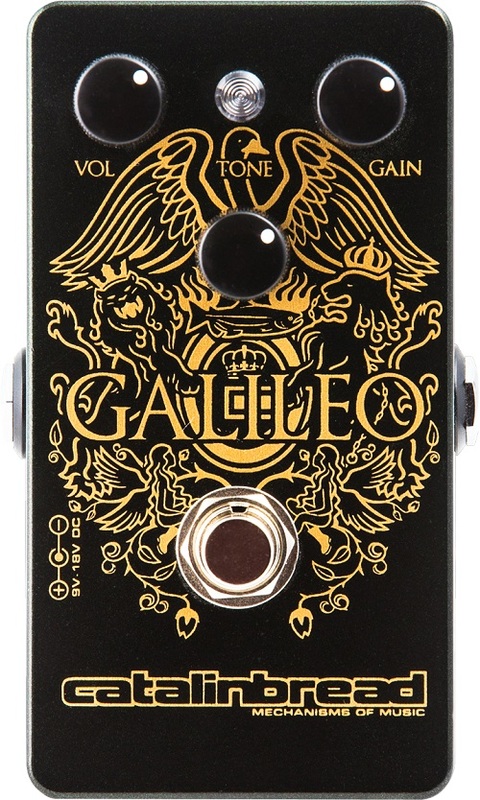 The Galileo has three controls tuned to deliver the essence of the Brian May sound – GAIN, TONE, and VOLUME. With guitar volume knob turned full up, you’ll get the soaring lead tones and tight but aggressive rhythm tones of Brian May. Turn your guitar volume knob down slightly and you’ll be tying your mother down all night. Turn your guitar down further and you’ll get an amazing jangly clean sound that isn’t really clean but is! In a full band context, this pedal will cut through with just the right frequencies to fit perfectly in the mix.